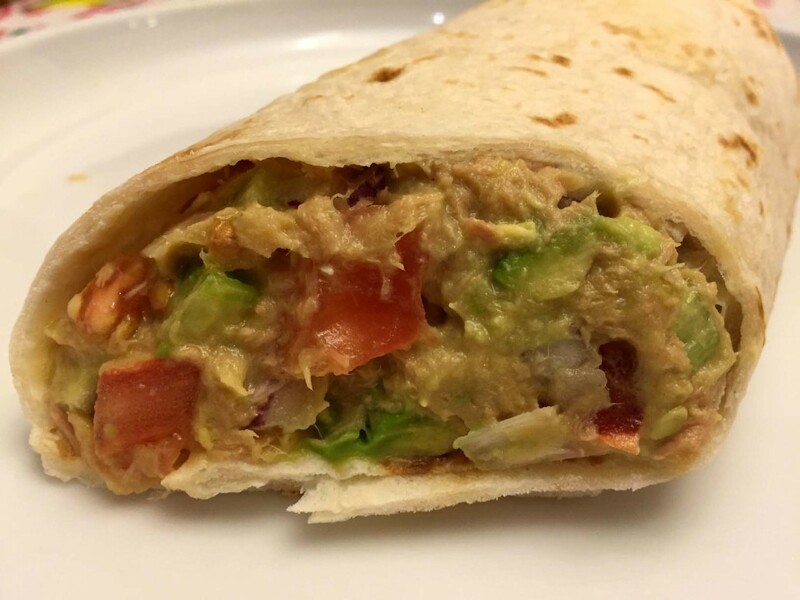 This tuna avocado salad wrap recipe is a snap to make, and it’s so yummy and healthy! Healthy tuna salad without mayo – what a great find! This yummy and filling wrap makes a perfect high-protein low-carb lunch or dinner! If you are looking for an easy and yummy high-protein low-carb recipe, you are going to love these tuna avocado salad wraps! 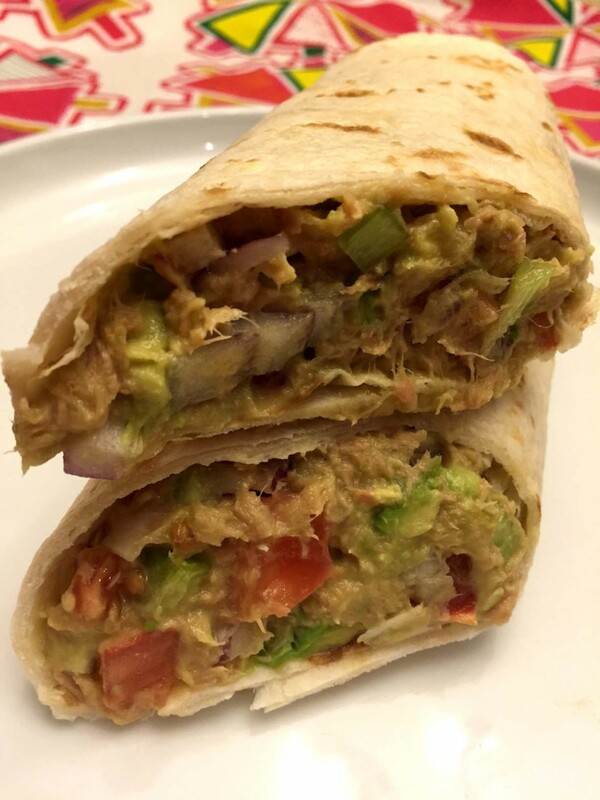 Chunk tuna is mixed with mashed avocado and fresh chopped tomatoes, onions and celery for crunch! This healthy tuna meal can be eaten straight out of the bowl as a salad, or wrap into a tortilla for a portable tuna avocado salad wrap! It can be made in 10 minutes from start to finish. Tuna avocado salad wraps don’t require any cooking and can really be made in 10 minutes flat! Just open a can and chop the veggies, mix it up and you are done. OK, if you are not as fast in chopping it might take you 20 minutes instead of 10 – still makes it an awesome speedy lunch or dinner! It uses all natural ingredients and doesn’t include mayo. Tuna salad without mayo? Yes, this is it! 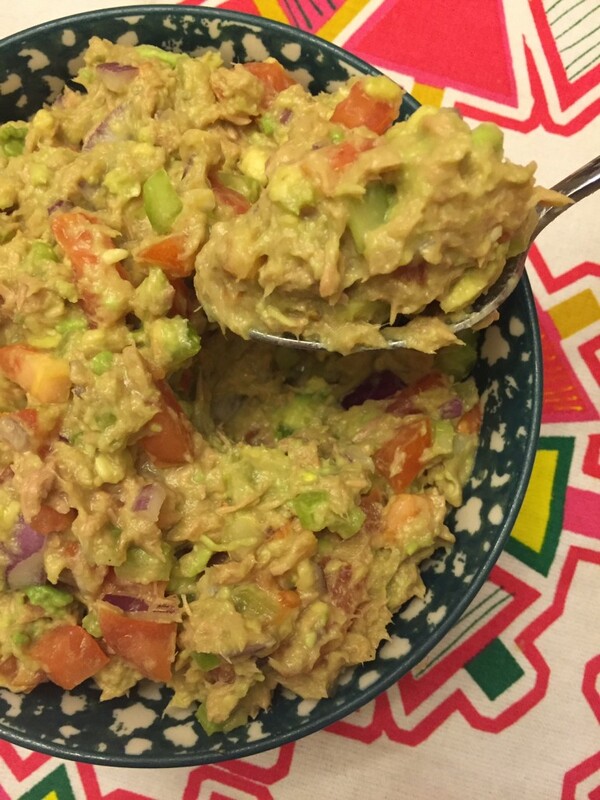 In this recipe, avocado acts as a dressing in a tuna salad, effectively replacing mayonnaise! Mashed avocado has the right texture for this task – it’s just as smooth and thick as mayo. Plus avocado has the right flavor as well to go with the tuna – just think of the tuna avocado sushi rolls 🙂 Avocado and tuna is the perfect combination – who needs the mayo after all! When it comes to healthy ingredients, avocado definitely wins against mayo. Avocado is all natural, while the canned mayo ingredients are like a chemical lab. Avocado has the healthy fats and lots of vitamins and antioxidants, while mayo has a high amount of saturated “bad” fat and virtually no nutrition. Read more on what are the health benefits of avocado. Tuna avocado salad wrap is high-protein and low-carb. 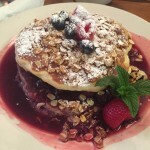 If you are cutting out the carbs to lose weight, this recipe is perfect for your high-protein, low-carb diet. To cut out the carbs completely, skip the tortilla and just eat this as a salad. You can also use a special “low carb” tortilla to make this wrap. 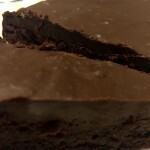 This recipe can be made ahead. 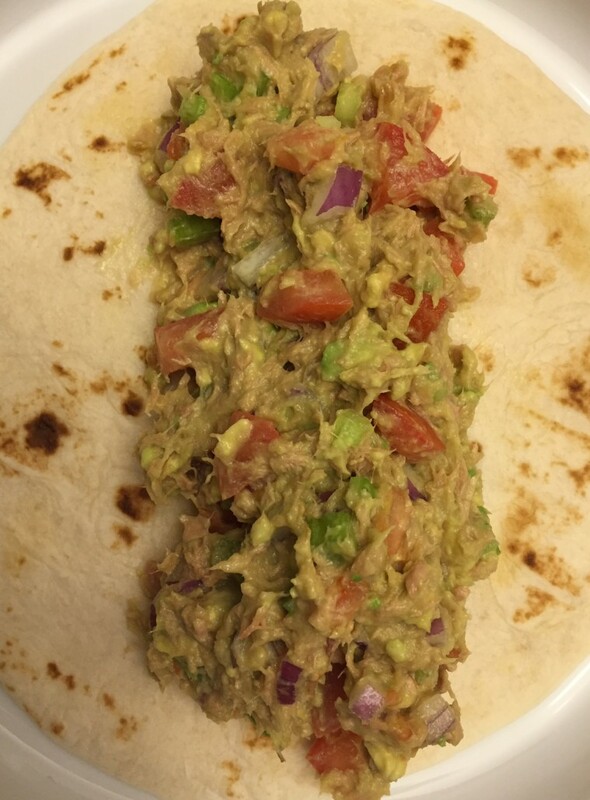 The delicious tuna avocado salad wrap uses avocado instead of mayo - genius! So much healthier than a traditional tuna salad, and really yummy too! Chopped tomatoes, onions and celery add delicious crunch - so good! Cut the avocadoes in half and remove the pit. Spoon the avocadoes out of the shell and put in a bowl. Mash the avocado with a fork. Squeeze the lemon on the avocado and mix with a fork until it's combined with the lemon juice. Add the tuna to the avocado. Finely chop the onion, celery and tomatoes and add to the avocado and tuna. Mixed the tuna salad until combined. Add salt and pepper to taste. Divide the tuna avocado salad between 4 flour tortillas, then roll the tortillas to make a wrap. Healthy Juicy Turkey Burgers Recipe – Best Ever!